Although it’s aimed at novice photographers and “selfie-takers”, the Lumix GX800 has the same sensor as the immensely popular Panasonic Lumix GH4 (announced in February 2014). This means the GX800’s Micro Four Thirds (MFT)-type digital Live MOS chip has a pixel count of 16.0 million and no low-pass filter. The sensor is paired with Panasonic’s Venus Engine, which enables a maximum sensitivity setting of ISO 25600, 4K video recording, and Panasonic’s 4K photo mode. Designed with portability and affordability in mind, the GX800 is very small and doesn’t have a viewfinder built in. The 3.0-inch, 1,040,000-dot touchscreen dominates the rear and has a hinge that allows it to be tipped up through 180 degrees for easier selfie-shooting. 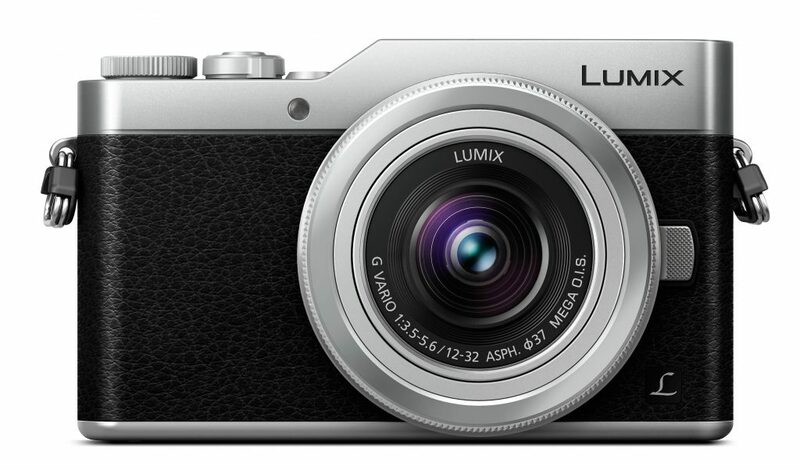 While it has the MFT mount and can be used with an extensive range of optics, the GX800 is often sold with the Panasonic Lumix G Vario 12-32mm f/3.5-5.6 lens, which makes a natural partner, thanks to its small size. 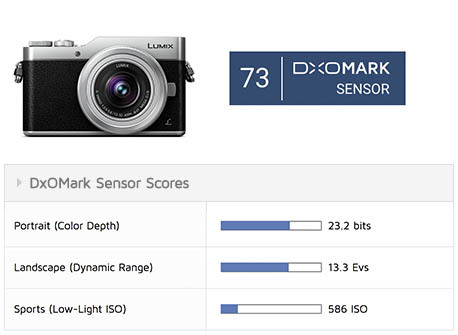 With a respectable overall score of 73, the Panasonic GX800’s sensor is the fifth-highest scoring Panasonic device that we’ve tested to date (the GH5’s sensor is the highest at 77). As usual, the best results are achieved at the GX800’s lowest sensitivity setting of ISO 100, when it captures 13.3 EV dynamic range, 23.3 bits color depth, and has a signal-to-noise ratio (SNR) of 37.9 decibels. The weakest aspect of the GX800’s performance is its low-light capability, which garnered a score of just ISO 586. This means that the sensitivity needs to be kept below this value to be sure of good image quality. Comparing the GX800’s sensor performance with that of other Panasonic compact system camera sensors reveals how close a match it is for the GH4 — a camera that was over three times the price of the GX800 at launch. However, changes to file processing enable the GX800 to capture about 0.5EV greater dynamic range (Landscape score) than the GH4. Unfortunately, this greater range appears to come at the expense of noise control at the higher sensitivity values. The GX800 is one of the most affordable compact system or mirrorless cameras currently available, and with the exception of its low-light performance (Sports score), it competes well with such popular (and more expensive) APS-C format cameras as the Sony A6000. Let’s take a closer look at how the GX800 compares with the Canon EOS M100 and the Sony A600, two APS-C format cameras at the more affordable end of the market. Our analysis reveals that the GX800’s color sensitivity is almost identical to that of the GH4, and at the lowest sensitivity settings, it’s a close match to the Canon M100. However, both the GX800 and the M100 lag behind the Sony A6000 by around a stop. Above ISO 400, the GX800 color sensitivity begins to decline quite steeply so that it falls further below that of the Canon M100 and the Sony A6000. The biggest difference comes when the GX800 is set to ISO 6400 (measured as ISO 3977), when it achieves a score of 14 bits. The M100 and A6000 don’t drop to this level until they are set to ISO 12,800. While this might sound dramatic, the differences in practical terms aren’t huge, and all three cameras should be kept to ISO 800 or lower to ensure good color sensitivity (20 bits or higher). Dynamic range, the ability to record a range of tones from very dark to very bright in a single image, is especially important to landscape photographers because their subjects often contain a bright sky and deep shadows. At the lowest sensitivity values favored by these photographers, the GX800’s sensor has a dynamic range of 13.25EV, the highest value of the three cameras — although only by a very small margin. 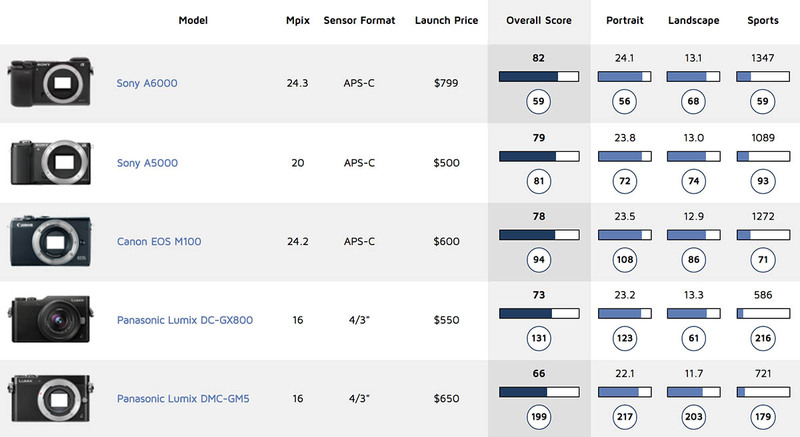 By ISO 400, however, the GX800 has dropped just a shade below the other two cameras, and the Sony A6000 takes the lead. Up to around ISO 6400, the difference between the GX800’s dynamic range and that of the A6000 is a maximum of about 0.5EV. This is likely to be evident only in scenes with very wide dynamic range, when the GX800 will lose detail in the shadows or highlights just a fraction sooner than the A6000. Above ISO 6400, the gaps widens, peaking at about a stop. At its lowest sensitivity setting, the GX800 achieves a signal-to-noise ratio of 37.9dB, whereas our threshold for high image quality is 38dB. When set to ISO 1600 (measured as ISO 920), the SNR slips below our acceptable score of 30dB — a value it achieves at just ISO 586. In practice, with the sensitivity control set to adjust in steps of 1/3 EV, this means you’ll need to set the ISO to 500 or lower to achieve good image quality. The Canon M100 and the Sony A6000 can both be pushed a stop (1EV) higher. The Panasonic Lumix GX800 is very small and attractively priced for novice photographers looking for their first interchangeable-lens camera. However, the sensor is showing its age a bit and the image quality is let down by its low-light performance. It’s a very compact option with the tiny 12-32mm lens, but for just a little more money, the Canon M100 and Sony A6000 offer better image quality in a wider range of conditions than the GX800.